Texas Gov. Rick Perry and Maryland Gov. Martin O'Malley join Newt Gingrich and Stephanie Cutter at 6:30pm ET to debate jobs and the economy. Republican Texas Gov. Rick Perry and Democratic Maryland Gov. Martin O'Malley have opposing views on the economy and are doing battle over which state has the better strategy when it comes to jobs and taxes. The two potential 2016 presidential candidates join hosts Stephanie Cutter and Newt Gingrich to debate this tonight in the Crossfire. 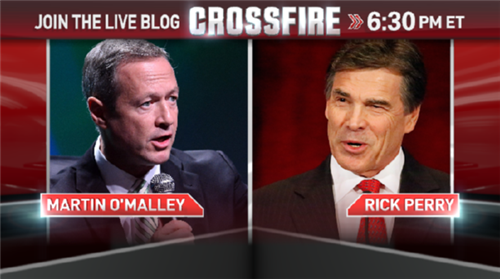 Join the debate by submitting your comments to the live blog or using #CrossfireReturns on Twitter and Facebook.